Sweet, chewy, salty, seedy. The ultimate seedy snack bar. 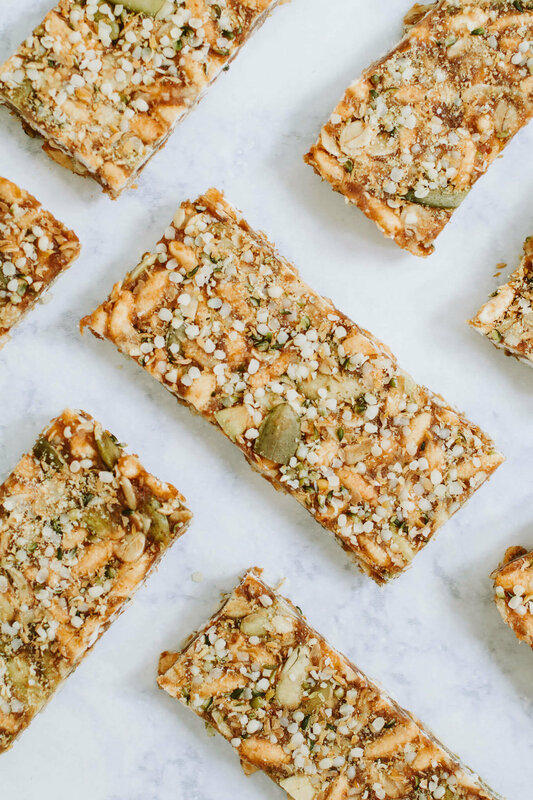 These puffed rice and seed bars are full of healthy fats, protein and carbohydrates making them the perfect snack to get you through a midday slump or kick a sweet craving. They are made from real food ingredients and naturally sweetened with dates. The base is made up of puffed brown rice, oats and pumpkin seeds. A vanilla spiced cashew date caramel holds the ingredients together. To amp up the nutrition, everything is topped off with ground flax and hemp seeds. These little bars are nutrient dense and packed with ingredients that will leave you feeling both satisfied and energized. The sticky date caramel tastes ultra decadent but is full of fiber and potassium from the dates and healthy fats and zinc from the cashews. These bars get a big nutrient boost from the mineral-rich seeds - pumpkin, flax and hemp. Make a batch of the bars next time you're meal prepping or have about 15 minutes to spare that way they are ready for convenient snacking, taking on-the-go, or enjoying in the evening for a sweet treat. Pumpkin Seeds: Also known as pepitas, these green gems are the best plant source of zinc. Since plant foods typically do not contain high quantities of zinc, incorporating pumpkin seeds into a plant-based diet is an easy way to help ensure you are getting enough of this important mineral. In addition, pumpkin seeds are an excellent source vitamin E, copper, magnesium and a unique blend of other antioxidants. Add these to oatmeal, on top of salads, or if you're feeling adventurous try making your own pumpkin seed milk. Hemp Seeds: My favorite seed and a nutrition superstar. Just two tablespoons provide 11 grams of protein, which is more than any other nut and seed. Hemp seeds are also full of healthy fats. Two tablespoons have 14 grams, 80% being essential fatty acids (22% omega-3 and 56% omega-6). In addition, hemp seeds are a good source of the antioxidant vitamin E, zinc, iron, and magnesium. While anyone can benefit from the addition of hemp seeds, I encourage they become a staple for anyone consuming a plant-based diet. My recommendation: Sprinkle on everything. Flax Seeds: These little brown or golden seeds are full or fiber and omega-3s. One tablespoon of ground flax has 2 grams of fiber and 3 grams of fat about half coming from ALA. ALA (alpha-linolenic acid) is the type of omaga-3 that is shown to improve heart health and reduce inflammation. In addition, flax is a good source of manganese, thiamin, and magnesium. However, in order to get the most out of flax it is best consumed ground. Whole flax seeds retain their nutrients longer than ground flax and can easily be ground using a coffee grinder. That being said, purchasing ground flax and incorporating it regularly still has more benefits than not consuming any at all. This recipe calls for cashew butter but it could easily be replaced with almond butter or peanut butter. To make this recipe nut-free replace the cashew butter with sunflower butter. The melted cashew coconut oil mixture will form a sticky ball with the pureed dates in the food processor. Don't worry this is what you want. Work this sticky "caramel" into your dry ingredients to form the bars. You can mix the hemp and flax into the bars and save yourself an extra step. These bars are best kept in the fridge or freezer, otherwise they'll get slightly sticky from the date and nut butter caramel. Place dates in a small bowl and cover with boiling water. Let sit for 10 minutes. In a small sauce pan combine the cashew butter, coconut oil, vanilla, cinnamon and sea salt. Let the ingredients melt, stirring occasionally. Once melted add the mixture to a food processor or high-speed blender. Drain the dates and add them to the food processor with a tablespoon of water. Blend until completely smooth. In a large bowl combine the puffed brown rice, pumpkin seeds and oats. Add in the sticky date mixture and combine until evenly distributed. Lightly oil a 8 x 11 inch pan (or 8 x 8) and press the mixture into the pan. This works best if your hands are lightly oiled as well. Top with ground flax and hemp seeds. Place parchment paper over the top and press down firmly so that the toppings stick. Freeze for 1 hour and slice. Best kept in the fridge or freezer for convenient snacks. Note: If your cashew butter is salted reduce sea salt to 1/4 teaspoon.